Last week I cut into one of the wheels of cheese I made back in April. I can’t believe we waited 8 months to eat it. It was worth the wait. The hard part is rationing it and making it last more than two or three days. P.S. in the background you can see one of the gourds I made. I really need to get back into playing with gourds. I have so much fun with it. I hope to clean out a spot on the screen porch to work on them. It is one of those things on that long list of things to do that I have. One day it will happen. Other things just seem to move in front of it – making soap, making cards, beadwork, puzzle. Addition: I learned to make hard cheese through a class I took at the Heritage Homestead near Waco, Texas. They offer soft and hard cheese making classes, along with so many other neat homesteading classes too. The classes where through the Center for Essential Education, but it looks like they may have renamed it to The Ploughshare. Same place, just different name I guess. They have several different homesteading-type classes from bee keeping to bread making. Fiber crafts to woodworking. They even have a working gristmill. 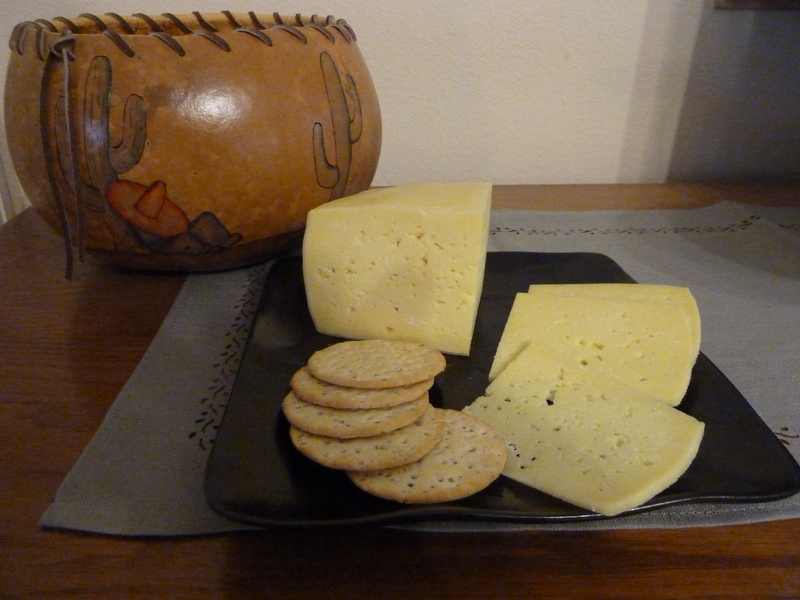 This entry was posted in Cheese, Gourds and tagged cheese, Monterey Jack Cheese. Bookmark the permalink. Looks great! Which recipe did you use? Looks great and tastes great – can’t beat that! I took a class on soft cheeses and one on hard cheeses through Heritage Homestead near Waco, TX. I am just going back into the post now to add the links to their website. Holy cow! Good job Emily! I hope one day to be able to make aged cheese. How did you learn? Making cheese is a lot of fun. I took a class at Heritage Homestead near Waco, TX. Here is the link http://www.cfeeschool.com/home.html. I will add it to the post. I took a 1-day class on soft cheeses and a 1-day class on hard cheese making. It was a lot of fun! I would go back for other classes they teach too. I’ll be taking their soft cheese class this spring! This fall I gave my friend the tuition to the class for her birthday so we can take it together. She always says she wants to be a cheese maker when she grows up so I hope this will provoke her. I’m glad to hear their classes are good! Their cheese classes were GREAT! Hands on. After class I jumped right in and started making cheese. I have outgrown the little dorm fridge I have been using (only could fit 6 wheels of cheese in there) and I want to get a large fridge so I can make more and more and more cheese. I find so many of the things I am doing addicting! I have cut back on cheese making until I figure out the large fridge thing. That cheese looks amazingly good, I can hardly believe it is homemade. I have not ventured into cheese making yet, accept for the simple “whole milk ricotta” cheese. The taste of the cheese is wonderful. Before hard cheese, I started with soft. I started making yogurt, then would turn the yogurt into a soft cheese by putting it in a muslin and into a strainer over a bowl w/a bit of weight on top. Let the whey drain off. Then add herbs – yum.